If you’re completely new to the world of bodybuilding or vegan supplements, you may not be entirely sure what a supplement stack is and why it’s such a big deal. We’ll cover supplement stacking basics in this article and give you some suggestions for vegan-optimized supplement stacks you can try. The theory behind dietary supplement stacking is that a lot of the nutrients and other elements that bodybuilders need for muscle growth to supplement work best when used together. For example, consuming branch-chain amino acids (BCAA) with glutamine is believed to assist with the process of digesting and using BCAA supplements, which results in a better delivery system for muscle mass and recovery. There is room for skepticism on whether these stacking combinations of multivitamins are actually as effective as they’re said to be; there just isn’t a whole lot of research on how effective supplements are in general, much less on how effective stacking is. However, it is a widely accepted practice in the sport, and the results that people who do stack tend to get can be said to speak for themselves. Because supplements are such a potential minefield for vegans, stacking can pose an extra problem due to the need for multiple different supplements. While there are pre-made, vegan-friendly stacks available, if you take stack development into your own hands, you’re going to have to make sure that each and every item you purchase is actually vegan-friendly. Some elements of supplement stacks are pretty easy to obtain in a vegan-friendly format. Vegan protein powders, for example, are widely available, as is vegan creatine. These are both common supplements that vegan bodybuilders do tend to stack due to the fact that creatine is not found in any plant-based dietary sources. However, while protein powders are considered a given for many bodybuilders, creatine is widely accepted as one of the most effective supplements available and it’s a popular foundation for a stack that includes other vegan-friendly elements like BCAA, omega-3 fatty acid supplements like flaxseed oil and the amino acid alanine. This stack not only provides vegan bodybuilders with the creatine they need but also drives muscle recovery, pain reduction, enhanced muscular energy, and lowers inflammation. Vegans can easily adapt stacks designed for meat eaters to suit their needs. All it takes is finding the right vegan-friendly elements to include in the stack so you can be sure to stick to your ethics and keep your focus on plant-derived nutrition. Swapping out fish oil for flaxseed oil and whey protein for pea protein with added BCAA to make up for what you’re missing from the whey is just the tip of the iceberg. There are many comparable vegan alternatives to animal-derived supplement ingredients and you can easily swap in additional supplements to make up for any missing elements in the vegan replacement. Some vegan-friendly supplement companies make pre-made supplements that combine multiple nutrients, compounds, and amino acids together in a single blend. If you’re trying to keep your supplement intake and spending to a minimum, these products may be your best bet. They make it easy to get a completely plant-based stack going without having to individually vet each and every product used in a stack. All you have to do is inspect the label on the one supplement and see whether it fits in with your vegan diet plan. As you’ll see below, inspecting the label beyond the product name can be essential. The concept of veganism in the bodybuilding community is rapidly gaining traction, but that doesn’t mean everyone understands what this lifestyle is all about. 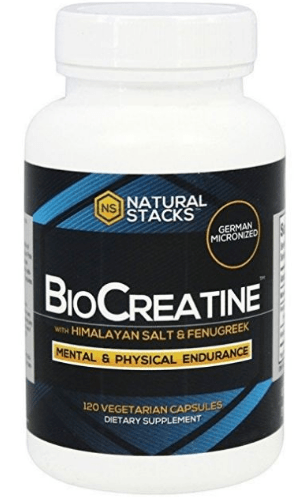 Natural Stacks Biocreatine Optimal Creatine Complex is a vegan creatine stack that combines micronized creatine monohydrate with all-natural Himalayan salt and fenugreek extract for an interesting combination of holistic elements that is said to assist with creatine transportation to the muscles without having to resort to the consumption of simple carbohydrates. This is a great example of how vegan ingredients can be useful in the creation of a stack that makes its core supplement better than it would be on its own. 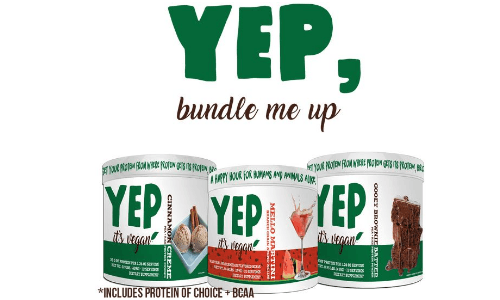 Yep, It’s Vegan makes an interesting pre-made stack called Yep, It’s a Stack, which includes two protein powders plus a BCAA powder. Protein and amino acids are a common stack for vegans since adequate protein consumption is such a concern for many vegan bodybuilders. The elements of this stack earn rave reviews for their excellent flavor, which may be a plus for those who generally dislike the artificial and unpleasant tastes that can characterize powdered supplement mixes. 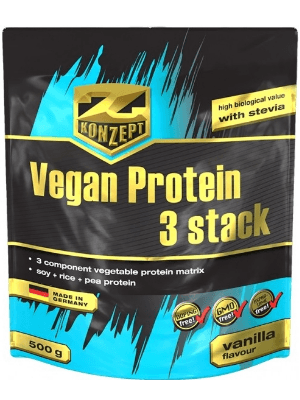 Z-KONZEPT Vegan Protein 3 Stack is a great example of a protein stack that includes all the amino acids, including the three BCAA. However, it’s also a great example of why it’s so important for vegan bodybuilders to read the label before buying a supplement: The nutrition facts small print states that this so-called vegan protein stack may include traces of egg protein.